I’m no longer in the habit of loitering on open street corners waiting to meet people for lunch. I no longer order tacos from trucks or gorge myself on lobster rolls or waffles and dinges. That was another world, a lifetime ago. Maybe it was actually a parallel universe. It’s hard to recall. But I know it all came crashing to a halt when my al fresco amigo, Zany packed up and left for Chicago. Sure, there were others who, on occasion, would join me for high calorie dining on the streets of New York. They were witty and well-dressed but Zany was the one….my partner in culinary crime. The Watson to my Holmes. The Robin to my Batman. The Mary to my Rhoda. It’s been four years since her gluttonous Food Truck farewell. And my world was never the same (although my diet may have improved). Apparently, the rumors of her demise were greatly exaggerated. Within seconds I reach her on the phone. It is true – she is moving back to New York! Much has changed since the Big Z left the Big Apple. She is now a VIP in the beauty business headquartered in Manhattan, and she and her husband are parents to two happy, well-fed kids, Sticky Hands and Jayhawk. Despite all this responsibility, Zany’s innate ability to sniff out a good meal is more fine tuned than ever. Almost immediately, she checks out the local territory. The day before our adventure, I get an email titled “Recon.” Zany writes with her characteristic enthusiasm, “46th between 6 and 5 is hopping with food trucks! They are parked all down the block…cheesesteaks, tacos, Greek, Thai… Plus there is ample seating in this plaza I’m in.” Clearly her appetite has not diminished either. Immediately, we spot our prey, the Coney Shack truck. The stunning black and red vehicle hails from Brooklyn, and features an eclectic menu of Southeast Asian tacos, burritos and hot dogs generously garnished with seafood, chicken, pork or beef. I know. It’s hard to believe, but I kid you not. It’s the ultimate mash up to use meat as a condiment atop a hot dog, and it is fortuitous as it is National Hotdog Day – our patriotic celebration of the wacky wiener! We line up to place our order, and Zany looks at me askance with a devious smile and says, “Amanda, eat your heart out!” Apparently, she has taken note of her lunchtime successors. I sense a smack down in the making. “Nothing wrong with a little competition,” she adds with a the confident smile of a champion. Our grub in hand, we head to a nearby outdoor plaza where the street party is in full swing. There’s even a reggae band. Sometimes, I wonder who’s really working in Manhattan. Zany has gotten very good at dividing food into bite-sized portions, and starts to split up our hot dog sampling platter. We’ve ordered the Mach Dog, “toppled” with caramelized pork, onion rings and melted Mex cheese all nicely browned with a blow torch, the Chicka Dog, topped with garlic lemongrass chicken and pickled daikon, and the Calamari Dog, topped with crispy 5 spice calamari. You can barely see the dogs under all the toppings, but each is better than the next. We savor the collision of proteins and Asian spices and take a moment to pray for all those poor souls who are celebrating National Hot Dog Day with a dirty water dog from a street cart. A lady is hovering over our table hoping to claim our seats, and we need something to neutralize the nitrates, so we head off in search of dessert. After wandering for several blocks we locate an ice cream truck with an intense selection of sprinkles that rivals a Crayola Crayon box. I’m game. In fact, I feel like I’ve got a new, caloric lease on lunchtime. Screw the kale salad. We make plans for our next meet up and say our goodbyes. Zany starts heading east. I take my last lick of ice cream and I expect my tongue is probably now cobalt blue. That will really make a great impression at my afternoon meeting. I turn to look back, but Zany is gone, vanished into the throng of people on 6th Avenue. For a minute, I wonder if I’ve hallucinated the whole adventure, but maybe it’s the hot dog coma kicking in. Note to self: I’ve got to start biking again. Yes, it was a long, cold winter. But, once again Restoration Farm is in full swing and bursting with life. And, I am in a constant state of anxiety trying to manage the overwhelming amount of produce I lug home every week. When you join a CSA, the battle over spoilage is constant (why does that seemingly indestructible kale seem to wilt so quickly?) along with a healthy helping of guilt served up whenever that carefully raised local food withers, shrivels or develops a rash. But now, I have the answer to my seasonal dilemma. I know certain wags among you will assume I'm drowning my angst by hitting the liquor cabinet, but I’m referring to pickling of the more homespun variety. A simple brine of vinegar, sugar, salt, garlic and spices can pack some amazing flavor, and summer produce just soaks it all in. Apparently, a penchant for pickling might be a genetic thing. A long time ago, Long Island was a bit of a pickle paradise, with “salting stations” dotting the landscape. HJ Heinz even operated a pickling factory in Hicksville, Long Island in the late 1800s. 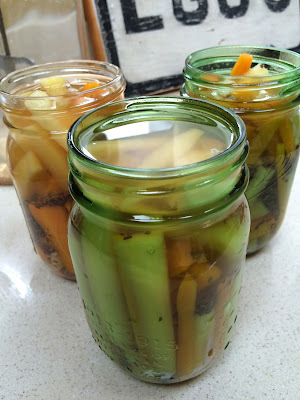 Most pickling can be accomplished without using a boiling water canner. These are technically known as “refrigerator pickles.” They aren’t shelf stable, but last about a month in the refrigerator. The only potential downside is the kitchen counters can get a little tacky from all that sugar and vinegar. I start with two varieties. I slice up the first of the summer zucchini into spears and pickle it in a brine of turmeric and mustard seed. 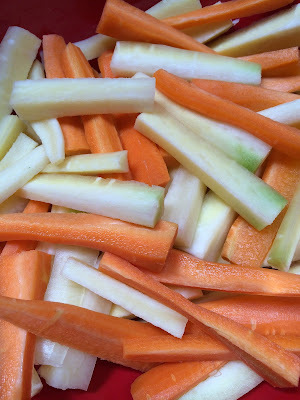 You simply slice up the vegetables (the zucchini needs to sit for about an hour in a salted water bath), simmer the brine a few minutes, cover the vegetables, let the mixture cool and then refrigerate. A clean up note: Clorox Cleanup does a bang up job of removing turmeric stains from the kitchen counter. The idea of infusing carrots with brine intrigues me, so I get both orange and white carrots to work with. The orange carrots are from Restoration Farm, and the white carrots are from Terry Farm in Orient Point, one of the oldest operating farms on Long Island. The brine is infused with dill. The zucchini recipe can be found here. My zucchini was various sizes so I chose to cut it all into spears. The carrot recipe can be found here. I’m thrilled because there’s a ready-to-eat side dish in the refrigerator waiting for me each night so the need to turn on the stove in the summer is negligible. I’m now researching pickled beets, although the recipe I have in mind does require processing in a boiling water canner. Along with the carrots and zucchini, there’s been another project marinating this past winter. More on that soon, as well as the story of a familiar (although never glimpsed) face from the past with a healthy appetite, who is ready to take a bite out of New York once again.